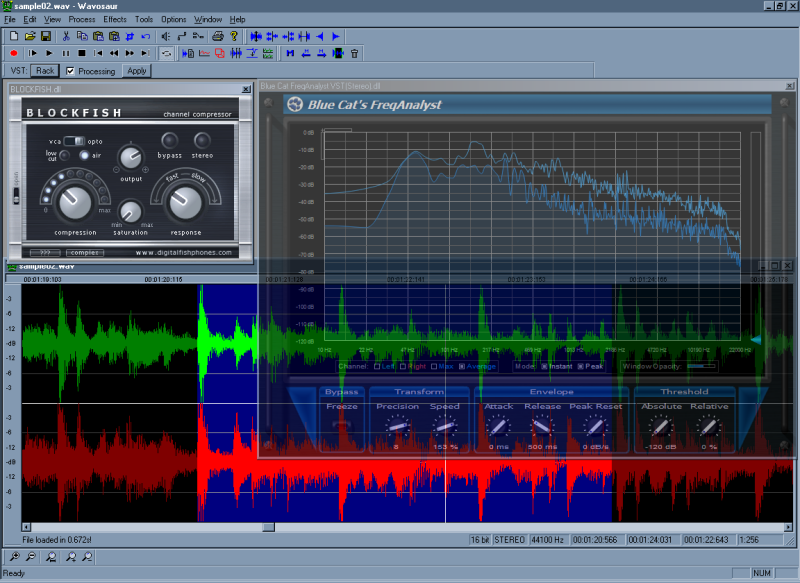 Wavosaur is a free audio editor. It has the standard and advanced features for editing your digital audio files. Wavosaur can work with ASIO drivers for optimal performance, you can do audio routing, import wav, aiff, iff, mp3, AKAI S1000, vox, multichannel wav and raw binary files. - normalize, fade in/out, mute, "vocal remover", reverse, insert silence, etc. - Loop points and markers support : load, edit, save cue points for using with hardware/software samplers, automatic markers insertion (at BPM, on silence). - analysis tools : 2D & 3D spectrum, detailled statistics, sonogram. - export multiple wav from marked region, export as text for import in software like Matlab, Excel, PSpice. you can use VST plugins in real time, displays the graphic user interface and tweak parameters in real time, this means unlimited possibility for sound designing, mastering, and all audio manipulations, thanks to the huge number of quality VST effects. Detailed statistics : RMS power, min & max value. Frequency analysis : 2D spectrum & 3D spectrum, sonogram. Real time oscilloscope & sonogram. Synthesis : waveform generator : sin, saw, square, triangle, white noise, frequency impulse train (useful for calibration and measurement). The batch processor lets you process many files at once. The soft can also be triggered by MIDI with a MIDI controler.